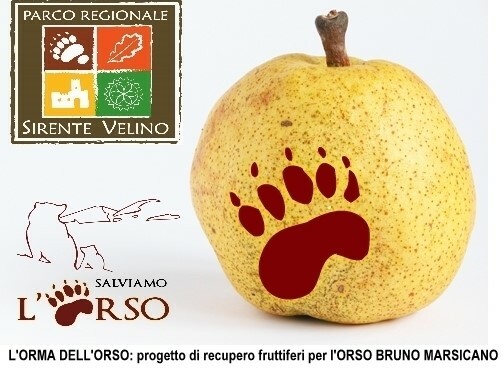 The Bear’s track: We have chosen this title because both the logo of the Sirente Velino Regional Park (SVRP) and the logo of Salviamo l’Orso show a bear’s track. Finding tracks of the Marsican brown bears (Ursus arctos marsicanus) within the area of intervention is the most reliable tool to verify the effectiveness of this project. The pear and the track (in this case a kind of quality brand) in the logo proposal Figure 1 aims to represent the relationship between fruit trees and the bear. Figure 1 – Project logo The Bear’s track. According to PATOM (Action Plan for the Protection of the Marsican Bear), the SVRP is considered a peripheral location in terms of the territory of the Marsican brown bear. Nevertheless, the SVRP territory provides fundamental connections between the Abruzzo, Lazio and Molise National Parks (ALMNP); the core area of the current Marsican brown bear population. The SVRP also provides connections to other potentially suitable areas such as the Duchessa Nature Reserve, Cicolano sub-region of Lazio, and the Gran Sasso and Laga Mountains National Park. According to PATOM’s Actions A4 (new presence areas) and A3 (connection areas) the future of this species, on the brink of extinction, depends strictly upon on its capability expand outside of the core area of ALMNP, and the Buffer Zone. Thus, Salviamo l’Orso is implementing new methods to improve the suitability of the project area, enabling the possibility of hosting individual brown bears and/or possible family units dispersing from the ALMNP. The organisation aims to provide an enhancement of food sources in a territory where the presence of bears, although occasional, has been historically proven and also recently confirmed. This is possible through the rehabilitation of abandoned and unproductive fruit tree groves, i.e. ACTION C.7 of LIFE ARCTOS project, supporting the ‘enhancement of food sources for the Marsican brown bear in the ALMNP and Buffer Zone’. This project also incorporates scientific objectives; signs of the bear’s presence i.e. tracks, scats, tufts of fur etc. within the fruit groves helps with the monitoring of the species movements, as well as the count of individuals by providing genetic samples. One of Salviamo l’Orso’s defining principles is to spread the “culture of the bear”. With this in mind, every initiative is not solely an action of conservation, but also an opportunity to involve the local population and the media. This works to raise a more widespread awareness of the importance of protecting this flagship species of the Italian and Abruzzo fauna, along with its habitat. The chosen study area is composed of abandoned fruit trees groves within the SVRP in territories where the presence of Marsican brown bears has been proven. 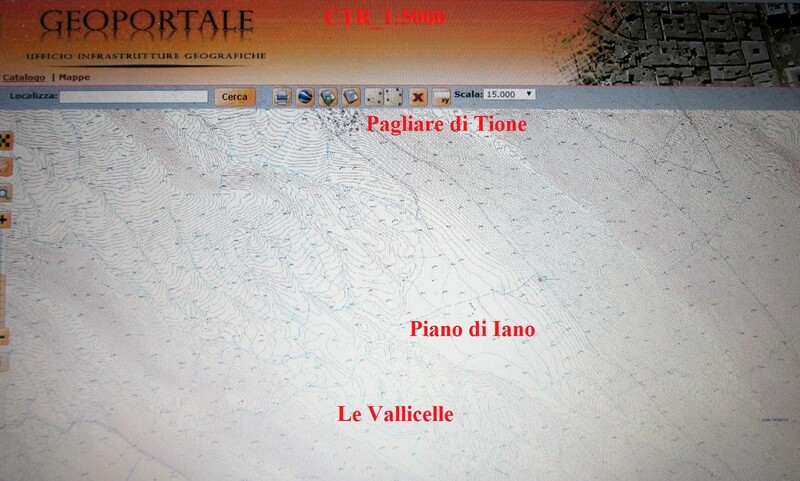 The focus will be concentrated upon the areas of Pagliare di Tione, Piano di Iano and Le Vallicelle, in the municipal territory of Tione degli Abruzzi (see Figure 2). 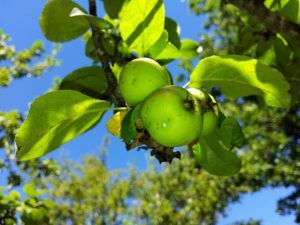 The SVRP provided a 2014-2016 grant for the purchase of the necessary material for maintenance of fruit tree groves and monitoring of the project areas, and in terms of human resources there are the members of Salviamo l’Orso ONLUS. To increase the presence of the Marsican brown bear and promote its population growth. It is scientifically proven that the reproductive success of a species is directly compared to the availability of food sources. To recover the man-bear-land relationship through the rediscovering of traditional economic resources which formed an important part of the Abruzzo mountain culture, as testified on by the pagliare di Tione. The loss of direct knowledge of the rural heritage of our lands has led to a nature and culture deficit within modern communities, deprived of a set of lost oral knowledge; perfectly represented by the current depletions of the once lively fruit tree groves. The recovery of these groves does not exclude acquiring a renewed awareness about the intimate relationship between man and nature that has characterized the Abruzzo people for centuries. The survival of the bear to this day is perhaps the highest expression of this relationship, and should bring pride to the people of Abruzzo. To value areas of strong historic and cultural heritage, such as Pagliare di Tione (for the ancient use of pagliare in the period of summer grazing and for storing straw and hay). If needed, bee hives and small farms in and around the project area will be secured by electrified fences to prevent bear damage and possible conflicts with the locals. These interventions are mentioned in the ACTION C.5 of LIFE ARCTOS (electrified fences to secure livestock, bee hives and valuable cultivations in critical areas and their maintenance). SVRP, Salviamo l’Orso members, Municipality of Tione degli Abruzzi, school children, the general public. Identification of abandoned fruit tree groves in the municipal territory of Tione degli Abruzzi, and the marking of these locations by GPS. Analysis of the land to identify vegetal species to preserve and those to remove. 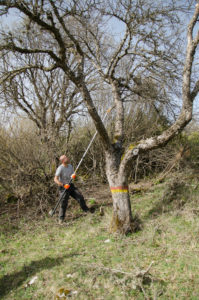 Request for authorization to the Municipality and the SVRP to carry out the fruit tree recovery and maintenance work. Project information material (panels, brochures, articles and publications on the Salviamo l’Orso website and social media). 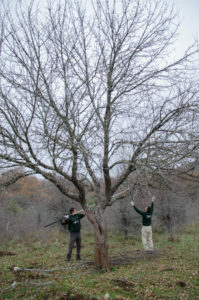 Cutting away invasive species of no conservational value to free fruit trees and trim them properly. Environmental awareness meetings in local schools. Figure 3. Different phases of pruning (November 2015; April 2016) and the first results obtained (fruits, August 2016). Vigna Taglianti, A. 2003. Ursus arctos, Linnaeus 1758. Note di sistematica. In Fauna d’Italia, Volume XXXVII. Mammalia. III. Carnivora-Artiodactyla. Calderini, Bologna, Italia, pp. 87-92. Tarquinio G., 2001. Testimonianze storiche della presenza dell’orso bruno Marsicano in Abruzzo e nelle aree limitrofe. Grafitalia Edizioni, Sora, pp.80. Taglienti A., 1984. Il Monastero di Trisulti e il Castello di Collepardo. Terra Nostra Ed., Roma, pp.529.